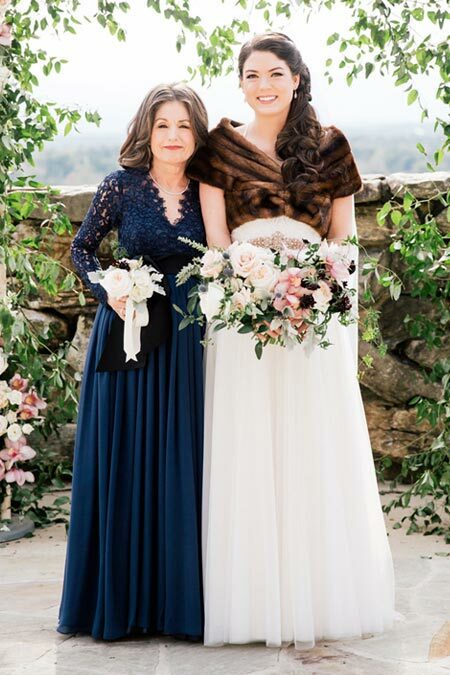 Design Your Dream Mother of the Bride Dress! It’s your daughter’s big day. It’s your big day, too. Design your custom fitted, bespoke mother of the bride dress in collaboration with Angela—because you deserve to wear something as unique as you are! 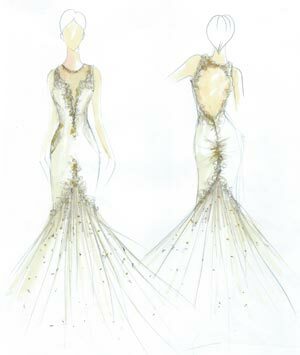 Imagine having a custom couture dream dress designed just for you! Designer and dressmaker Angela Kim knows how to bring your special vision to life in luxurious, custom wedding apparel. You’ll have an unforgettable experience that you can share with your daughter as you prepare together for the big day. Angela is an expert at creating just the right look to compliment you and the bride. She tells your unique story in the finest fabrics with rich details. You’ll appreciate the experience of working with a professional designer who knows how to guide the process and effortlessly bring out your best look. If you visit us in our Asheville atelier, you’ll be treated to a glass of champagne with your fitting sessions, which often include some laughs, a few happy tears, and lots of good memories. Angela works with clients from across the region and around the country. She can consult with you via video chat, phone or email. Angela is a couture dress designer and dressmaker with over 20 years of experience working internationally in the fashion industry. She brings an expert and professional touch to every project, ensuring that all the details are perfect, using only the highest quality fabrics and embellishments. All of Angela’s dresses are one-of-a-kind designs, inspired by your vision and story. You’ll love the look and feel of a custom couture dress, and you’ll cherish the memorable, luxurious experience of working with a professional couturier. During your first meeting with Angela, you’ll talk about ideas and concepts for your dress, choose fabrics and select a silhouette. Bring pictures or examples of what you like, and what you don’t. If you are coordinating your look with the bride, Angela will help you develop a vision that incorporates your key elements and compliments the bride’s style. If you’re visiting our atelier, invite the bride to join you and share a memorable moment as you bring your dream dress to life together. The couture design process normally requires from six to twelve months, depending on a number of factors. The length of your project will vary according to the complexity of the design and the bride’s timeline. Construction time depends on the fabrics and details we’ve selected. If you are visiting our atelier for alterations and fittings, you’ll be able to monitor the evolving design throughout the tailoring process. 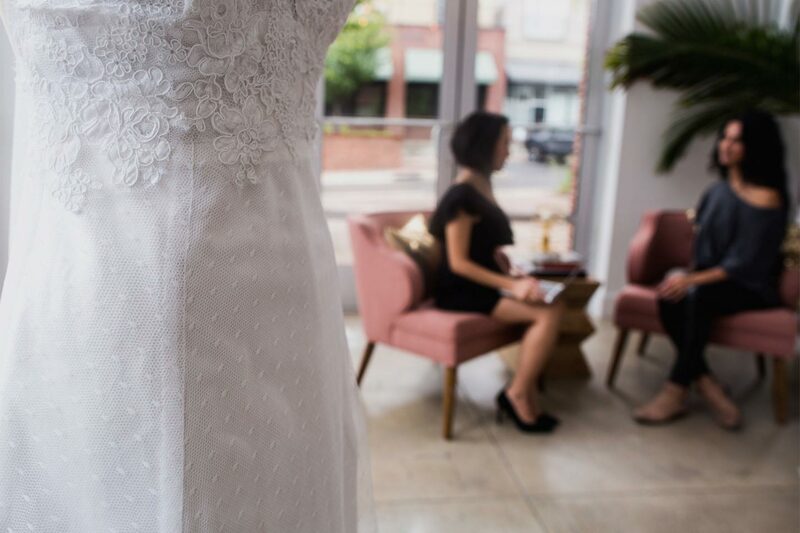 For our local or visiting brides, there is no extra charge for regular fitting sessions at our Asheville atelier. Fitting sessions are an important and fun part of the construction process as your dress comes to life. Out-of-town clients will need to have measurements taken by your local seamstress (according to specifications we will provide) . All of Angela’s custom couture dresses are designed according to your measurements. If you are not available to have Angela take your measurements herself, you will need to have your local seamstress take them according to instructions we will provide. When properly measured (and provided that the client does not experience major weight changes), the dress should need few if any alterations. Any further alterations after the dress has been delivered would be up to the client. The price of your one-of-a-kind, custom couture design will be determined by a number of factors, including fabric selection and details, the number of fitting sessions, and construction time. Like every client, each project is unique, and Angela will help guide you to the right solution for your needs. Please contact us for a quote on your project. In addition to bridal apparel and mother of the bride dresses, Angela also designs cocktail dresses, evening gowns, and other bespoke clothing.